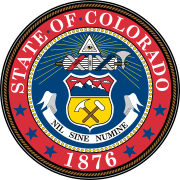 The 1992 United States presidential election in Colorado took place on November 3, 1992, as part of the 1992 United States presidential election. Voters chose eight representatives, or electors to the Electoral College, who voted for president and vice president. Colorado was won by the Democratic nominees, Governor Bill Clinton of Arkansas and his running mate Senator Al Gore of Tennessee. Clinton and Gore defeated the Republican nominees, incumbent President George H.W. Bush of Texas and Senator Dan Quayle of Indiana. Independent businessman Ross Perot of Texas, and his running mate Navy Vice Admiral James Stockdale, finished in a relatively strong third in the state. Ross Perot performed relatively well for a third party candidate in the state, receiving 23.32% of the vote in Colorado, exceeding his nationwide 18.91% vote share. Perot also won pluralities of the vote in Moffat County and San Juan County, the state providing Perot two county victories out of only fifteen county equivalents which Perot won nationwide. Clinton ultimately won the national vote, defeating incumbent President Bush. Clinton's victory marked the first time since the nationwide Democratic landslide of 1964 that Colorado had voted Democratic, and his win signified Colorado's transition from a traditionally Republican state into a competitive swing state in modern elections. Colorado had not previously voted Democratic in a close national election since 1948. Clinton would then very narrowly lose the state in the 1996 election to Bob Dole. As of the 2016 presidential election [update], this is the last election in which Mesa County, Garfield County, and Sedgwick County voted for the Democratic candidate, as well as the last time that Moffat County did not support the Republican candidate. Conversely, this is the last election in which Summit County voted for the Republican candidate. ^ a b "1992 Presidential General Election Results - Colorado". U.S. Election Atlas. Retrieved 8 June 2012. ^ "1992 Presidential General Election Results". U.S. Election Atlas. Retrieved 8 June 2012.